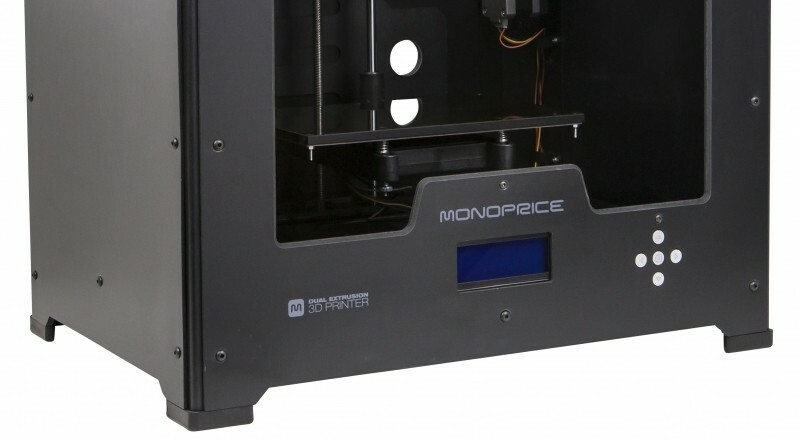 A new 3D printer is available for pre-order today from a somewhat unlikely source: Monoprice. The discount cable specialist on Thursday announced the Dual Color Extrusion 3D Printer, the company’s first foray into the world of 3D printing. It accepts 1.75mm ABS, PLA and PVA filaments and comes with two 1kg reels of PLA filament out of the box (one white and one black). If you want to add a bit more color, Monoprice will also sell you ABS and PLA filament in crystal clear, fluorescent yellow, bright orange, blue, red, purple and bright green. Other specifications include support for layer thicknesses from 0.1 ~ 0.5 mm. The extruder, meanwhile, can be heated to 250°C and the metal heating plate can be heated to 120°C. It prints at a rate of 24cc per hour. Monoprice likely isn’t the first place you’d check for a 3D printer (or other electronics for that matter) but the company has been expanding into other fields for quite some time now. They now offer a wealth of branded hardware – most of which offers excellent value for the money. The $1,200 price tag on the 3D printer may seem a bit steep – especially coming from Monoprice – but it’s actually one of the more affordable 3D printers that allows for two color print jobs. The price includes a six month warranty on replacement parts and free shipping. Early adopters should see the package arrive on their doorsteps by the end of this month.